Departing from downtown Portland, we’ll make our way along the Vineyard and Valley Scenic Route, past orchards, lavender fields, and farms, to the famous Willamette Valley. 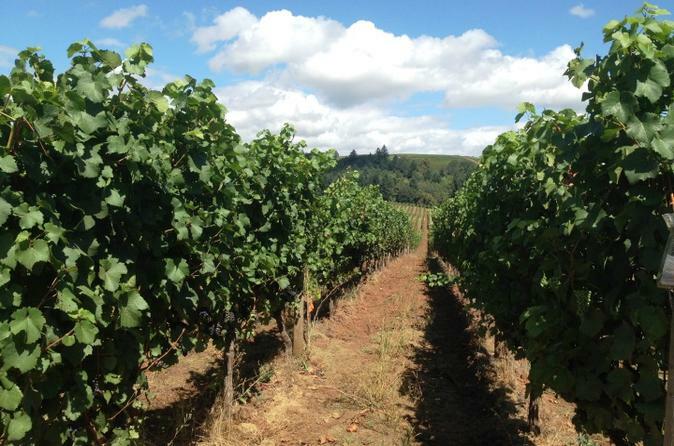 As Oregon’s leading wine region, the valley is home to more than 500 wineries. Recognized as of one of the premier Pinot Noir producing areas of the world, the wine from this area is often likened to France’s Burgundy region. Throughout the drive, our guide will share the history of Oregon wine production, how our valley was formed, and what makes its soil so idyllic for our world-famous wine grapes. We’ll also discuss the 6 different sub-appellations of the valley. In the heart of the Willamette Valley, we will visit three carefully selected wineries and vineyards, where we will partake in winery tours, viticulture talks, and wine tastings. Surrounded by the science, production, and study of grapes, our guests feel like experts in no time! From the wineries selected we’ll enjoy sweeping views of the Cascade Mountain Range as well as stunning rolling hill vineyard vistas. We will plan to visit one winery before we pause for lunch, after which we’ll make our way to two more wineries.At the end of the afternoon, we will bring you back to Downtown Portland, just in time for dinner. The wine tastings fees at each winery are included in the price of the tour. You will have a chance to purchase wine at the wineries. Most wineries offer convenient shipping options straight to your home.